Telstra has a long-standing sponsor relationship with both the Australian Olympic & Paralympics teams. They were one of only 4 Australian companies who were the telecast partners of the 2008 Beijing Olympic Games on Channel 7. 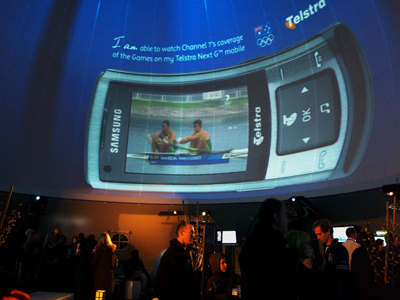 Momentum Worldwide contracted LM Productions to supply two StratoSphere venues for the Telstra Olympic Campaign. One 15m StratoSphere was located outside the Customs House in Sydney, and the other 10m StratoSphere was positioned outside the Crown Casino in Melbourne. This was the first time the StratoSphere was seen in Australia, and was met with much amazement!